After a long wait, WeMo products can finally be Apple HomeKit enabled with a bridge. It's quick setup and solid performance make it a worthwhile consideration for those invested in Apple's smart home ecosystem. Apple HomeKit users have been clamoring for almost a year now for compatibility with WeMo products. And with the release of the WeMo Bridge, that’s finally a reality. The $40 bridge from Belkin now acts as a go-between for your WeMo smart home gadgets and Apple HomeKit. The addition of Apple HomeKit is a feather in the cap for Belkin as it becomes one of the few companies that work with the three major smart home control systems. Google Home and Amazon Alexa support have been staples for years, but Apple’s heavy-handed security measures have caused many companies to shy away from HomeKit. While those restrictions have been loosened a bit, it’s still rare to see a company work with all three. 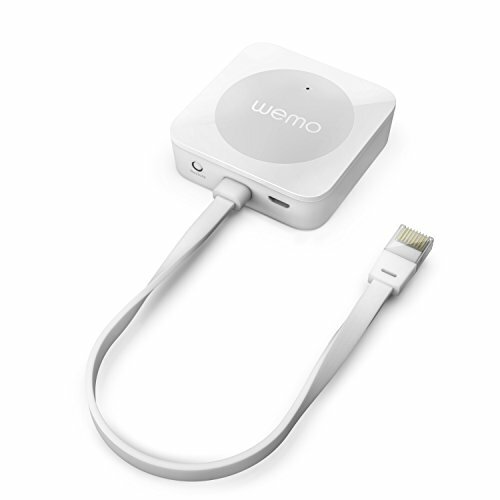 The WeMo Bridge is as basic looking as a device gets. It’s a white square about the size of a coaster and is powered via a micro USB cable. There is an attached LAN cable that you plug directly into your router. That LAN cable is where my issues with the WeMo Bridge design begins. First, it’s only 9 inches in length. This doesn’t leave much room for hiding the bridge. It’s going to have to sit right next to your router. And when you factor in an additional power cord, that’s some extra clutter to deal with. This would seem to be a perfect device to utilize Power over Ethernet (PoE). Which brings me to my biggest gripe, the lack of wireless connectivity. It’s understandable that Belkin would want to keep the price of an accessory like this down. And there certainly would be a bit more lag adding another wireless connection to the mix. But it would allow for more flexibility in placement and wouldn’t clog up another ethernet port on the router (which might be an issue for some people). Despite some issues with Belkin’s design choices, using the WeMo Bridge is simple. Connect the device to your router, plug it into an outlet, and then pull up the Home app on your iPhone or iPad. Choose “Add an Accessory”, followed by scanning the HomeKit setup code that is located on the guide. That’s it. It took about 3 minutes total to connect. Once added, all your existing WeMo products will show up on the screen. I was a bit surprised that not only did it find them all, but it had the correct names associated with them. I didn’t need to re-configure the dimmer switch in the bathroom (named “Upstairs Bathroom”) or the mini smart plug in the bedroom. They all worked within the Apple Home app immediately. While I’m not as harsh on the WeMo app as some, Apple Home is a huge upgrade. Grouping devices by room and setting up custom schedules are much easier now. You can configure WeMo devices to work with other HomeKit enabled products like my Philips Hue bulbs. But perhaps most importantly, you can finally ask Siri to dim the bedroom lights or turn on the ceiling fan. You’ll even be able to use voice commands with the new Apple HomePod speaker in the near future. As for the performance of the bridge, I loved it. Devices turned on and off almost instantaneously. In fact, I felt like there was less lag using Apple Home than with the official WeMo app. And outside of one instance where I needed to reboot the bridge, I didn’t run into any issues where devices would fail to respond. Despite the good news with performance, there are some limitations with the Belkin WeMo Bridge. The most glaring is that you might not be able to control your products in Apple Home if you’re away from your home. That’s because Apple requires one of their devices to be connected to your home’s network to authenticate incoming requests. It’s a security measure that has ruffled some feathers over the years. But you can get around this if you own an Apple TV (3rd generation on up), a HomePod speaker, or have an iPad sitting around the house that is connected to your home network while you’re away. Now if you don’t own those other items, this doesn’t mean your WeMo products won’t work remotely anymore. It just means that you have to use the WeMo app instead. A minor inconvenience for now that might change in the future as Apple has been willing to soften their HomeKit restrictions. The other limitation is that the bridge will not work with the discontinued line of WeMo LED light bulbs, coffee maker, or crock-pot. It does however work with everything else. The WeMo Dimmer Switch, WeMo Light Switch, WeMo Mini, all the other smart plugs (including the giant first generation one), and even their motion sensor. It’s a shame that a $40 bridge is required to use WeMo products with Apple HomeKit. Both sides are to blame for this. Belkin decided early on not to deal with Apple’s cumbersome restrictions but had to change course when demand arose. Apple’s stringent requirements (which have loosened a bit) caused companies to focus on Alexa and Google Assistant instead. So now we’re left with this fix. If you’re someone who’s invested in Apple Home and loves to use Siri, I think you’ll benefit from this. Apple Home is much easier to use than the WeMo app, especially if you have other HomeKit devices. And voice controls feel long overdue. It’s satisfying to say “Siri, turn on the kitchen lights” and have it work. Of course all this depends on how many WeMo products you have running in your home and whether $40 is worth “upgrading” them. Overall there are some design flaws and having to buy an additional bridge leaves a bad taste in my mouth. But it performs well, isn’t too expensive, and will finally make Apple enthusiasts happy.